"You couldn't hit a floor if you fell on it!" Even though the neversetting sun prevents the stars from being seen with a naked eye, they influence the world in subtle ways. 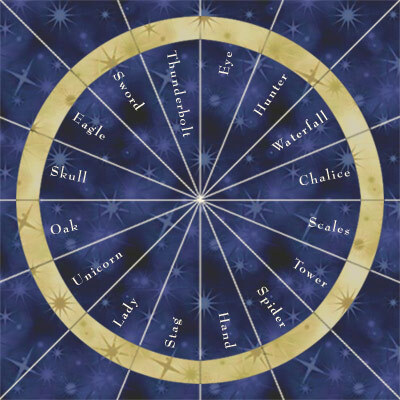 For a fee, an astrologer located somewhere in the Central Castle can tell you what the current constellation is, or make you a personal horoscope. There are also other, less important relationships between the signs, for example the Stag, the Lady and the Unicorn are generally known as the "Three Ladies" (being ruled by Selune, Freja and Mielikki respectively). The whole circle encompasses a symbolic reflection of two life cycles. These signs are further complemented by 5 aspects, each of them under the influence of one of the so-called "wandering stars". Little is known about the true nature of these stars, except for the fact that they follow their own cycle, different from that of the signs. Each of the five stars corresponds to one of the major deities. Albaluz Morning Star This bright white star is associated with Lathander. Silidor Sparkle Silvanus rules this constantly twinkling, sparkling star. Calamor Blood Star This star glows with a blood red hue and is associated with Tempus. Mandivone Dread Star A sinister, strangely foreboding star that has been associated with Hades. Denidex Shadow Star Tharizdun's mysterious star is always hidden behind a halo of misty haze. It is said that praying at a god's shrine at a time when the stars favour that god can bestow powerful blessings, even more pronounced for those who were born under the same sign.